Here's Why the Best Is Yet to Come for MercadoLibre, Inc. The Latin American e-commerce king had a record-breaking 2017. Here's why investors should stay the course. When investing in e-commerce, MercadoLibre, Inc. (NASDAQ:MELI) isn't exactly a household name, at least not to investors in the U.S. For those who live in Latin America, however, the company is the largest player in the region, tapping into the massive migration from brick-and-mortar stores to online sales. The trend of e-commerce has been gaining steam worldwide and shows no signs of slowing. Online retail sales growth is projected to hit $4.48 trillion, a gain of 246% from the $1.34 trillion achieved in 2014. In 2017 alone, e-commerce is forecast to grow 23% to $2.29 trillion and account for 10.1% of total global retail sales. MercadoLibre is uniquely situated to gain from this massive opportunity, and its performance this year has been stunning. Here's why I believe the best is yet to come for the company. 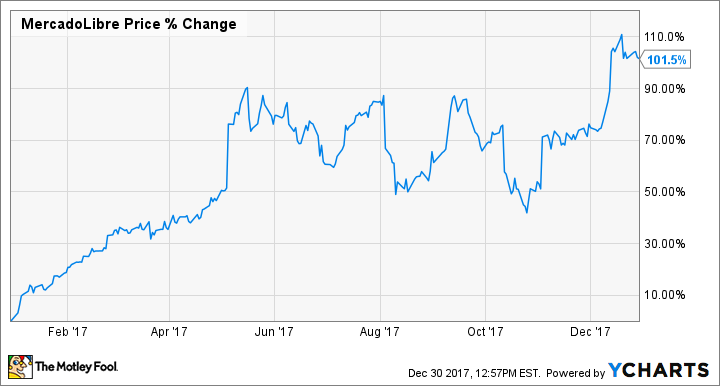 MercadoLibre has been one of the best-performing stocks of 2017. Image source: Getty Images. There are a number of local customs and idiosyncrasies that exist in Latin America that U.S. investors may be unaware of. Two of the more striking ones involve financial dealings. Many of the countries in the region are still cash-based, and 70% of the population doesn't have a bank account. Even more striking is that, depending on the country, only between 20% and 50% of consumers have a credit card. Where others saw a challenge, MercadoLibre saw an opportunity and the company has taken numerous steps to accommodate the customs of local shoppers. Early in its history, it developed a PayPal-like payment service called MercadoPago, which gave shoppers a new payment option. In some countries, it developed a network of locations including convenience stores that would accept cash payments from customers that could be loaded to their account. What began as a way to accommodate its online buyers and sellers has become a key factor in MercadoLibre's astonishing growth. The number of payment transactions has increased by 70%, on average, in each of the last 12 quarters. What's causing that rapid growth? MercadoPago has become so successful, MercadoLibre began offering the service to merchants that don't to business on its platform, causing adoption to accelerate. In its 2017 third quarter, those transactions grew 84% over the prior year quarter. Total payment volume exceeded $3.15 billion, up 73% year over year in U.S. dollars and 76% in local currencies. Those increases in payments wouldn't be happening without a growing user base and increasing sales. MercadoLibre's confirmed registered users exceed 200 million and have grown more than 19% year over year in every quarter going all the way back to 2011. More users lead to greater sales, with items sold producing year over year growth of 31% on average for the last 24 quarters. These metrics have resulted in impressive sales growth. In its most recent quarter, MercadoLibre achieved net revenue of $371 million, up 61% over the prior-year quarter in U.S. dollars and up 79% in local currencies -- its highest ever. MercadoLibre saw declines in operating income, falling 16.7% to $30 million, as the company expanded its free shipping and customer loyalty programs to fend off the threat of looming competition from Amazon.com, Inc. (NASDAQ:AMZN). Launching these programs and expanding them across its marketplace gives MercadoLibre an edge, taking a page from Amazon's own playbook, and gaining a key advantage. MercadoLibre has also been expanding the small business loans it makes available to its vendors. The region has a low penetration rate for traditional banking services, making working capital loans difficult to obtain for most sellers. With more than a decade of data and artificial intelligence algorithms, the company has more granular information than most banks, allowing it to more accurately predict the merchants that are most likely to repay the loans. Investors should know that as a high-growth company, MercadoLibre isn't cheap by traditional metrics. Its trailing-12-month P/E is 104 and its forward multiple is an even higher 116. A high valuation and competition from Amazon may give some investors pause. Still, analysts expect the company to grow its revenue by 44% next year and its earnings to increase by 24%. The company has executed its plan almost flawlessly and its stock doubled in 2017. It continues to grow its base of both customers and sellers. MercadoLibre is the trusted local brand in Latin America, and I think the best is yet to come from this scrappy upstart.